The work on little penguins around Wellington continues, now that most of the nesting pairs have one or two chicks to feed. This week Te Papa scientists and helpers from various disciplines on the Te Papa staff have been putting out loggers on the chick-rearing penguins, both in Evan’s Bay and Day’s Bay. Wellington harbour seen from the Picton ferry, showing the city and port area, an area used by little penguins for foraging from Evan’s Bay. Image: Susan Waugh; Copyright, Te Papa. Our previous work showed that the incubating penguins were exploiting a range of habitats across Wellington coastal areas. 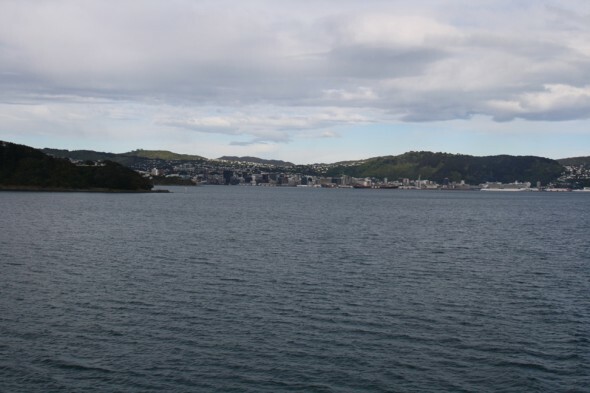 Some penguins used the Wellington harbour areas exclusively. 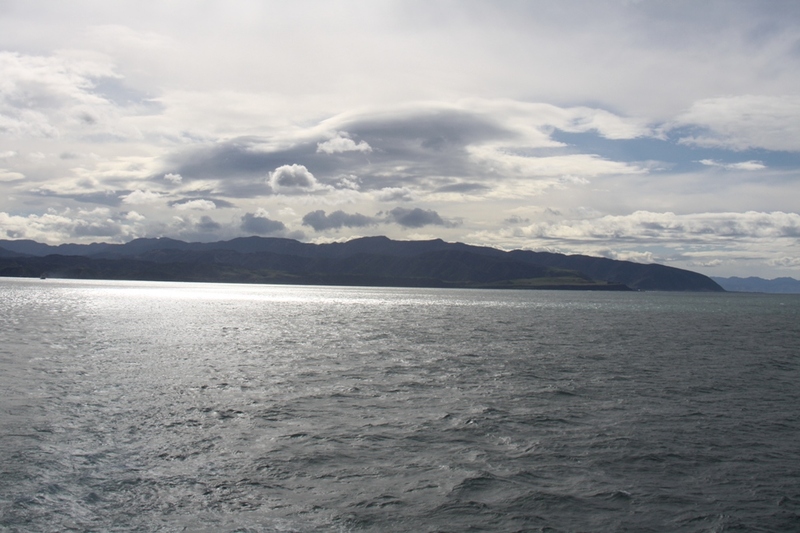 Others fed outside the bay with several foraging trips to Fitzroy Bay and Palliser Bay. Palliser Bay and the waters outside of Wellington Harbour heads, and area used by many seabirds in New Zealand, and commonly by little penguins from Wellington Harbour breeding sites. Image Susan Waugh, Copyright Te Papa. During chick rearing, there are tremendous energetic demands on the adult penguins, as they need to bring food regularly to their growing chicks. In many of the Wellington harbour nests, adults are managing to raise 2 chicks at one time. This suggests that food supply for these birds is good, at least this season. Birds are visiting the chicks regularly, possibly daily or every 2 days. Foraging tracks of little penguins from Evan’s Bay during October (red) for a bird during incubation phase of the breeding cycle which carried out longer trips and at greater distances than the bird from November (blue) that has chicks and stayed with Wellington Harbour, but visited the harbour mouth area twice in a 3 day period. Image: Google Earth, Copyright Te Papa. 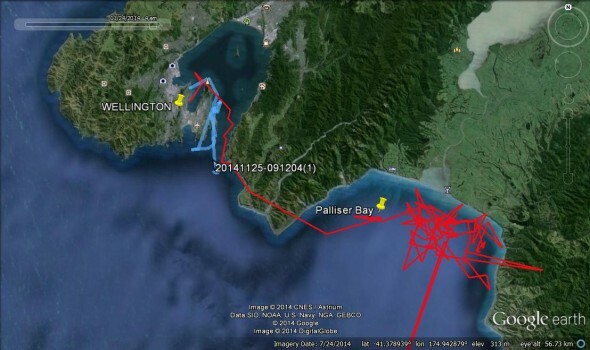 The first track recovered from a chick-rearing bird (above, blue), tracked from Evans bay showed that it travelled to the waters of the Wellington Harbour mouth twice in the 3 days the logger was deployed. This was a period of strong westerly winds and large swells, so we’re not sure whether it would have left the harbour in calmer conditions. But certainly the harbour mouth area, as well as the Evans Bay and wider Wellington Harbour appear to be important foraging zones for the penguin tracked, whose track is shown here. 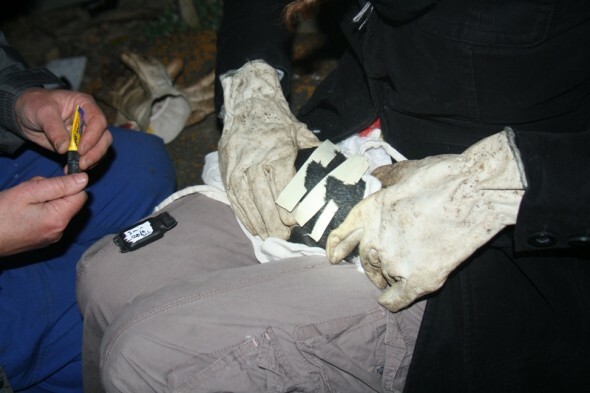 Logger attachment in action for a little penguin, showing the tape sticking to the underside of back feathers which we wrap around the logger, the logger (black object on the handler’s knee). Image Becky Etherington, Copyright Te Papa. Transmitters attached are the same GPS (data-logging) variety used in incubation tracking, and are attached to the back feathers of the birds using waterproof tape, along with a dob of glue which adheres to the feathers and provides extra attachment strength for the loggers. At the time we attach the loggers, we weigh the birds and measure the beak to determine whether the bird is male (larger) or female (shorter beaks). A little penguin is measured to assess the length of its beak with calipers during logger attachment. Image Becky Etherington, Copyright Te Papa. We’ll continue to update the blog over the next few weeks with our findings, and look forward to your comments and questions.